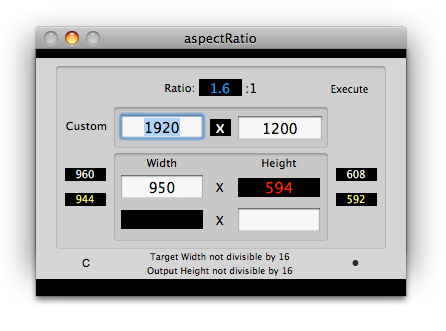 At this point I’ve implemented a suggested dimensions method that displays values evenly divisible by 16. The results are triggered by the Target Width and returned Output Height calculation. Also included in this release: a user defined output font color preference setting [orange/red], and a Menu option that re-opens the main UI window if the user inadvertently closes it while the application is still running.